Members of the OECD Development Assistance Committee (DAC) are increasingly working with the private sector in development co-operation to realise sustainable development outcomes. To learn from this experience, the DAC introduced a peer learning review on working with and through the private sector in development co-operation. Private Sector Engagement for Sustainable Development: Lessons from the DAC examines the politics, policies and institutions behind private sector engagement, the focus and delivery of private sector engagements, private sector engagement portfolios, effective partnership and thematic issues including risk, leverage and ensuring results. Drawing on the practical experiences of DAC members, the report highlights good practice, provides a typology of private sector engagement and outlines key lessons. It highlights the importance of aligning private sector engagements to overall development co-operation strategies and aid effectiveness principles. It also looks at investing in institutional capacities, developing a suite of flexible mechanisms for private sector engagement, and adopting appropriate systems to monitor, evaluate and report on the results of partnerships with the private sector. Access the peer learning webpage for all other outputs. 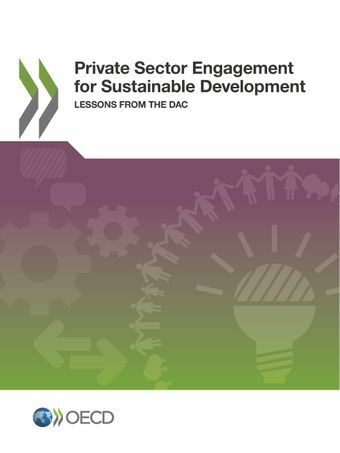 Read more on OECD DAC’s private sector related work.